Money – it’s a part of life whether we like or not, so it pays (pun intended) to be smart with your money so I have put together the ULTIMATE MONEY GUIDE, with all my best posts for saving money, making money, budgeting & organising finances all in one convenient place. Budgeting and managing finances have always been some of my strengths. It tends to be the one area of my life that I keep organised no matter what, and you should do the same. Why? Because it can help you save money! How? When you are more aware of your finances coming in and going out, you are less likely to overspend, more likely to choose financial products that save money and overall end up with more cash in your pocket. Good reason! 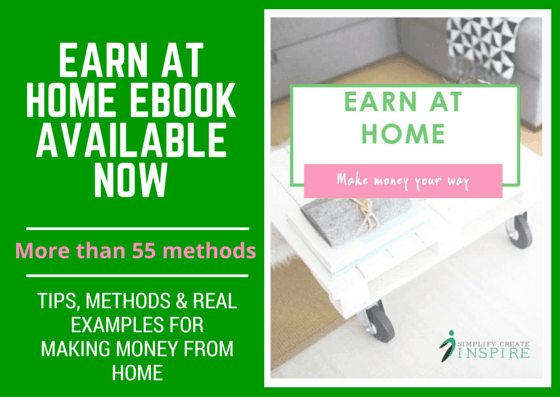 If you want to learn more about how you can start working from home, grab my first ebook ‘Earn At Home’, full of tips, ideas and methods of earning from home, as well as real life examples and ways to help you decide what options are best for you. Yes quite the round up, with more to add as they go live. It’s nice having a place to find them all together for readers. Thanks for sharing on Twitter too. This is a great resource! Thanks for sharing all these in one place.